The law says you don't need a Fire Risk Assessment for a domestic property**. ​but if you love your beautiful and unique home, you do need an "Historic Home Fire Safety Appraisal" to properly protect it. **NOTE: If you run any type of commercial venture from your listed home, you may need a Fire Risk Assessment by law. See the Info Box at the bottom of this page for more details. ​​​Steve Emery, chair the Institute of Fire Engineers and former National Fire Adviser for English Heritage, said that "every year there are tens of thousands of fires in listed buildings in the UK, but since the vast majority are privately owned, it is hard to keep track of all the damage." Given that many heritage homes are in remote locations, and may be far away from the nearest fire station, Mr Glockling added that the only real option is for buildings to be self sufficient and for owners to assess their own fire prevention and protection needs. Fire occurs because of a failure to prevent it. Fire destroys because of a failure to control it. Many forward-looking owners of historic homes have chosen to voluntarily have a professional assessment made of their fire hazards to help prevent fire, and so bring them peace of mind and protect and preserve their beautiful and unique home. If you are planning to start restoration or renovation work on your property, this is a particularly good time to contact us. ​Please click on each title below to find out more, and why you need us for your peace of mind and to protect your home from fire. 80% of historic buildings are privately owned domestic houses. At Heritage & Ecclesiastical Fire Protection we passionately believe that every historic building, both domestic and non-domestic, deserves the best protection from fire. That belief has led us to develop a type of fire risk assessment that is suitable for use in domestic properties that will give advice to the owner and guidance on fire protection that is specific to your home. Why wouldn't you want to protect your home, your greatest asset? Although the risk of fire can never be completely eliminated, we can assist you in preventing fires and helping to contain it and minimise damage should one occur. We achieve this through our unique "Historic Home Fire Safety Appraisal". Statistically, a domestic premises is at a higher risk of a fire starting than a non-domestic premises, and tragically, also at a higher risk of a fire-related fatality (82% of fire related deaths are in the home). Fire is ruthless, especially in older buildings, with the potential, not only to threaten life, but to completely destroy any property, interior and precious artefacts, totally consuming its historic fabric. Those legally-binding requirements to protect and preserve a historic building account for nothing with fire because a fire in a period house can be totally devastating. When we see a heritage building engulfed in flames, it reminds us of just how much history is wrapped up in it and how fire can take away hundreds of years of our heritage in the matter of a couple of hours. Almost 9 out of every 10 fires in the home are accidental and although accidents happen, ultimately all are avoidable with some foresight. Every year you pay large insurance premiums to cover you for loss in a fire or other disaster, but your insurance will do nothing to prevent fires happening. If you are unfortunate enough to lose your historic home to a fire, how long will it take to rebuild it? Will your insurance cover all the cost to reinstate it using traditional materials and methods matching the original, irrespective of cost, as required by the law? When it is finally rebuilt will it just be a fake reproduction of what it once was - remember one the historic fabric has burned, it is gone forever. Those who built and lived in these old buildings centuries ago were, generally, far more aware and familiar with the risks of fire than the modern occupier. These houses were raised in a time before building and fire regulations and the use of fire resistant construction materials. It was a time when naked flames were commonplace within the home for life's essentials such as cooking, heating and lighting. Around 500 mansions and country houses, and innumerable smaller historic homes, were destroyed by fire between 1850 and 1950. Many homeowners resorted to having a range of "first aid" fire fighting methods to hand including "fire grenades" in a valiant effort to protect their homes. Today, with our modern conveniences, much of that knowledge and foresight has been forgotten, leaving period homes vulnerable again to fire and, although we have fewer naked flames, electricity is now the cause of more than half of all fires in the home - 15,500 a year. So, where do you look for help? There is very little official guidance published for the very specific fire risks in domestic heritage buildings. Home fire safety guides give only general information that is more relevant to modern houses. 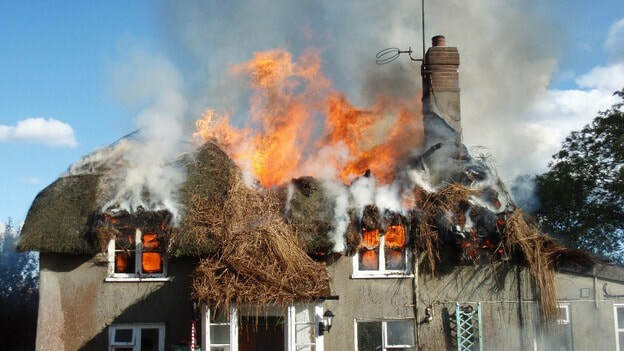 Your local Fire and Rescue Service may provide a "Safe and Well" visit (formerly called a "Home Fire Safety Check"), but again this is not specifically for listed buildings and will not provide you with the specialist and up to date information you need. Note: Most F&R Services now only provide Safe and Well visits to the most vulnerable in the community. ​So where to you get that expert advice that you need to protect your heritage home? ​Only from a Fire Safety Consultancy that fully understands heritage buildings. Please read on to find out more. Historic Home Fire Safety Appraisal Gift Vouchers - Looking for a unique gift idea for an owner of a Listed Property? - Click Here! ​Fire Risk Assessments are tried and tested and are known to protect life and property in non-domestic buildings, so it is logical that the same thing will be true in a domestic building. That is why we offer an equivalent fire safety assessment designed specifically for your home, which we call the "Historic Home Fire Safety Appraisal". ​Identify fire hazards and fire potential, including electrical, heat and naked-flame sources. Identify ways to reduce the fire potential throughout your home. ​Report on any of your domestic appliances if they appear on the Product Recall Register. Advise on the potential for, and how to reduce, fire spread in your property. Advise on potential passive and active equipment to detect, suppress and contain fire. Give sympathetic consideration for the historic features and aesthetics of your home. Advise on "Heritage-friendly" fire safety equipment suppliers and installers. Advise on bedtime routines to make your home safer whilst you sleep. Advise on planning for your escape in the event of a fire. Assess the expected emergency attendance time for the Fire & Rescue Service. Include photographs, where necessary, to illustrate any concerns. Liaise with the local Fire Service, arranging for a familiarisation visit, where necessary. Provide advice on salvage / damage limitation. ​Call us to discuss your requirements without obligation and fully protect your home from fire. Throughout history, fire has been the great scourge of the country house. A recent report by Historic England shows that 1 in 5 (21%) owners of residential listed properties are also running some kind of commercial venture from them. Activities include opening up areas of their properties or outbuildings to the public as temporary art galleries, renting them out as office space, and providing accommodation such as B&Bs. Others are making their properties available for events such as weddings, parties and business functions or using them for retail activities - such as cafes. If you run a commercial venture from your home and employ staff or allow access to the public, (other than house guests), you may require a Fire Risk Assessment by law. Contact us for free, no obligation advice.